I just started watching a new show called Orange. It’s under the 2016 Summer Anime list, if anyone is wonder. It got me thinking about this project I did back when I was 16, where we had to write a letter addressed to our past selves. I can remember giving my 13 year old self a huge lecture on how I should have been more out going and less occupied with what others thought about me. At 16, I thought that I knew everything. My parents still say that I think I know everything, and that I enjoy correcting people (mostly my mother). My mom thinks I’m egotistical due to the fact that I’m a musician. I couldn’t deny it because there are days when I spend hours just looking at myself…and I do take a lot of selfies (I don’t share them anywhere). To be honest I think what happened was, after being a moody 13 year old with a low self-esteem, I went to high school and decided I no longer cared if I wasn’t with the in-crowd. As you can see, I’m no longer ashamed to admit that I watch anime. One of my closest childhood friends from when I was 3 or 4 was from Japan, and so they used to buy me animes on VHS. No I don’t call myself an otaku. Yes I also read manga, but I enjoy comics in general (Archie anyone? Gotta love Jughead). So basically, to get back on topic, I realized that just because my hobbies have always consisted of writing, watching anime and music didn’t mean that I had to hide it from people. I figured, if people liked me for who I was then that was great. It was stupid trying to lie about what shows I watched and what sports I liked when I wasn’t really into any of that. While all my friends played football (American), I was more interested in pretending I was a Jedi knight…or petting the stray cat that liked to visit us at recess. So I suppose my 16 year old self had a reason to be so harsh towards my 13 year old self. The thing is, looking back now, being 13 and 16 was equally stressful and I went through experiences that…well at the time made me feel like the sky was falling. Now that I’m considered an adult (who drinks mountain dew instead of beer and uses a starwars cup while using the worlds best Spiderman bookmark), I think I can say that I’ve realized that each part of my life is a new challenge. It seems hard at the time but once I get over it, it feels like it was a breeze. From my first time being extremely jealous to my first date. My first experience with death to my first time holding a new baby. From bad grades to bulking down. From writing an entire novel without chapters or page numbers to becoming more organized and actually planning things out. The big and the small, all molded me into the somewhat adult I am today…although all the 16 year olds I work with think I’m the same age. There are many goals that I have for myself this new year. I want to do well in school, I want to continue to build long lasting relationships with my friends, I want to lose that last bit of freshman fat I’ve still got lingering on my belly and of course I want to complete my novel. I started handwriting my novel back in 2013. I was actually shocked when I realized this. The first six novels I wrote took around three months each to complete…although I started those in the 7th grade when I had a lot more free time on my hands. I suppose I also didn’t spend much time focusing on my education, like I have been doing over the last four or five years. I can definitely say that I’ve come a long way academically. I’ve done a lot of work on my three personal writing projects during the winter break. I like to put a lot of effort into the world of the novel, which is why I think my first novels only took me three months to complete and this one has taken around three years. Before I didn’t do any research or planning. In the 7th grade I simply sat down on the carpet by the radio with a pencil and some paper and I wrote. There was no such thing as writers block and I sure didn’t stress out over any accidental plot holes. In high school I became more serious about my work and started to teach myself how to write better, how to edit and how to research (the library is an excellent tool). I’ve written many things in my lifetime but this year I’m ready to finish this novel and get it published. I’m looking forward to an awesome new year. Don’t get swindled into those diet and work out commercials though. Walking for an hour a day will help you lose weight just as well, and it wont cost a fortune. I’m just saying…especially for those of you who are on a tight budget. For my first novel I went through things such as my characters favourite colours, the foods they liked to eat, their family members, their pets (if they had any), their preferred styles of clothing, their favourite genres…etc. I gave them birthdays (I even celebrated them), and full names and talked about them to my family and friends as though they were actual people. Sometimes I would go through my day pretending to be them in certain situations (I don’t recommend this…unless you want to be more confident playing basketball). The amount of work I put into that novel (which became a 6 book series) was…well it was fun but it did distract me from things like school and that wasn’t okay. Plus some of the stuff was a little…let’s just say much. I was only thirteen then, and I didn’t have a laptop or a cellphone so…I had spare time to be imaginative. Anyway, now instead of writing out complete profiles for characters, I only write out things that are of extreme importance to me. Things that have an effect on the story and my characters progression throughout. It still takes work, and it still takes time but it is worth it. Trust me. I’d like to caution you not to…well put too much into your characters back story. A complicated back story is hard to express throughout the novel without it a) stressing you out and b) making the character hard to follow and also…a bit annoying. It’s alright to have a tragic back story for your characters, but do so in a delicate fashion. Don’t just throw things into the story because it’s “dramatic” and “heart-wrenching.” As a book lover and an author…I find that stuff irritating. I don’t mind if Bob’s parent’s were tragically killed in a car accident when he was little and that he has to live with his abusive grandfather, who hates him because his daughter married Bob’s father without her father’s blessing. Bob’s dream is to become a jockey but his grandfather is against it because he doesn’t think Bob will make much money. That’s a back story that has some depth and explanation…it’s saying “Yah this character’s an orphan and his grandpa’s a jerk” without adding in unnecessary background drama that does absolutely nothing for the story. For example, Bob’s grandfather’s great-uncle Hank was trampled by a team of horses right in front of him. Bob also has a prosthetic leg because of the car accident. He has horrible flash backs about his first love being run over by a drunk driver while they were racing each other across the street. Bob’s claustrophobic and his grandfather is dying of a rare disease that eats away at your bones…or something. Do not do that! Please! I am begging you! I’ve read so many short stories by young people and they throw in so much of this…”drama” thinking that it’s good. This isn’t anime guys! Stop! Just stop! I’m trying to help you…please no over dramatic, tragic back stories. Please…. October has begun, and I’ve worked on my novel maybe once since arriving here. I’m still wondering if it’s the new atmosphere that is causing me to feel as though I’m not in the mood to work. I’m in love with this novel…it’s like my spouse and my child all in one. I know that’s a strange way to put it, as I’m not yet in a relationship nor do I have my own children at this time, so I don’t exactly know what those kind of relationships are like…. Nevertheless I feel as though this novel encourages and supports me, and also that it is something I must nurture and build up. It makes me wonder if writers make good parents? Well at least I’ve been blogging and doing homework. I mean, schoolwork is and should be my first priority. I’ve thankfully been doing a lot of doodling and sketching during class…yah I know I should be paying attention, but lectures are long and not all of my professors stay on topic themselves. When their minds begin to wander so does mine, right to the page in front of me. It isn’t like I’m not listening or anything! I am…most of the time. I also think I’ve put on weight. I haven’t gone to the gym since I’ve arrived…not that I’m much of a gym person. I’m active, but I have a fast metabolism so I don’t have to work out as much as say my parents. I’ve definitely begun to notice a change in my health though and I don’t like it. I haven’t been feeling well recently and I believe it’s because of what I’m eating. I would never eat this much at home and because I’m not exercising it’s making me feel worse. Plus I’ve been a little stressed out as I’ve had many tests and assignments recently, and even though they’re light weight compared to what my friends doing the sciences have, it is still a bit stressful. This week especially was pretty frustrating. I ran out of print credits before I needed to hand in two assignments, I’m out of laundry money because the dryer robbed me of a $1.70 and I’m exhausted because I stayed up late because I wasn’t feeling well and couldn’t sleep. I’ve had a headache since I got here. I can’t believe I’ve been here a month….I feel adjusted. I don’t have a hard time adapting to new situations, however I’m exhausted. I can’t recall ever feeling this tired this often. I feel like an old person….and I’m eighteen. Well, I’ve complained enough for one day. I’m debating on whether or not it’s a good idea to head home and see the family this weekend. I mean, I’m going home for Thanks Giving in a week (Canadian), so I’ll see them then…. I honestly don’t know. My Dad says I need to stop saying, “I don’t know,” because apparently I’ve been saying it in every conversation I’ve had with him for the past two weeks. Yah…sorry about that Dad. I guess I’ll end it here for today. I feel like I’ve just rambled on and on and on and on. So I hope that you all have a wonderful weekend, and that you all stay healthy and strong and don’t get stressed out over anything. Hopefully the weather stays nice! Oh and for anyone who has midterms right now, keep up the good work and stay golden. Growing up is like being on a swing: first you’re placed onto a swing that will hold you in securely, because at this point you’re not strong enough to hold on by yourself. On this swing your parents give you a nice gentle push and you sit there and enjoy the ride. 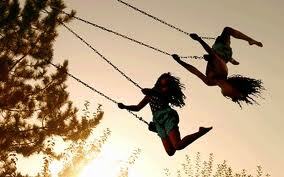 When you’re ready, your parents place you onto a new swing, one without anything to help you stay on. Now that you are stronger you can hold on by yourself. Still your parents give you a gentle push but one day the push gets harder. Your parents begin to give you under doggies, and the swing bounces in all directions, some of these directions are ones that you shouldn’t go in, but your parents are right there to grab you and pull you back before anything goes wrong. Finally you’re asked to pump your legs. Your parents believe you’re ready to swing all on your own. You start slow and work your way up. Soon you are doing daring things, like standing on the swing as it moves, or even jumping off of the swing and onto the earth below. You’re without any restraints. You are now free to decide your own limits. You rock the entire swing set and lay on your stomach so that you can see the ground. You do things that you know your parents wouldn’t be proud of, and you do things that you know they would love. You’re officially on your own but even though now you are stronger, you sometimes need someone to come by and give you a little push. This week I started university. The first day was a bit overwhelming. When my family left I wasn’t sure of what to do with myself for the next few hours. I felt almost as though they had abandoned me, even though I had been so excited to live on my own and make new friends. Days later I began to meet great new people and today I am preparing for my very first lecture. I’m excited for the class and am looking forward to the novels that we will be reading as well as the things we’re going to study. I hope that I will enjoy the course and that I will like the professor. Everyone at this university seems very friendly and easy going. It isn’t hard to make friends and for the first time I’m actually happy to be back at school in September. Thank you to all of the wonderful ISW leaders here at my school for introducing me to cool people and for making the transition from High school to University so much easier. When we knew each other, I thought you were perfect just as you were. With every single flaw that made you human. Now that you’ve been changed by someone else, I’m afraid that you’ve turned into something horrid: a person that I can only hope, you will break away from. I miss you. I don’t want to leave things like this. This is something I wish I could say to a buddy of mine. I miss them and I hope that we don’t go off from high school never speaking a word to one another. A woman I call, Mrs. Honesty.